Huge Funky ANIMANIACS PINBALL GAME EARRINGS Novelty Costume Jewelry - KISS HEART - Real Mini Pin Ball Puzzle Collectible Toy. 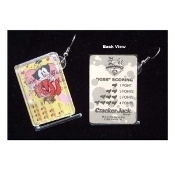 Genuine Circa 1996 Vintage Miniature Cracker Jack Prizes Plastic Charms, each approx. 1.75-inch (4.38cm) tall x 1-inch (2.5cm) wide.